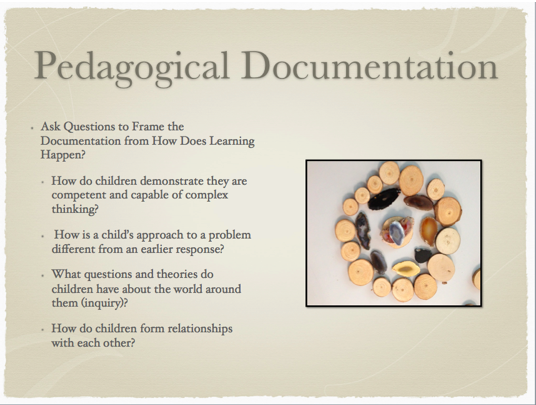 Pedagogical Documentation: Why? When? Who? What? Where? How? By: Diane Kashin, Ed.D, RECE. As someone who has been asked often to teach pedagogical documentation to students and professionals, I grapple with the process and all it entails. 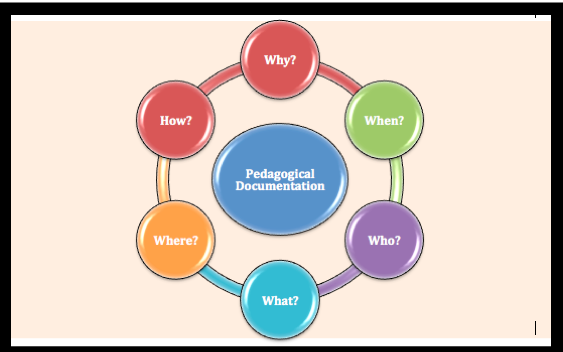 It is difficult to define pedagogical documentation as definitions run from the simple to the complex. I like the way Ontario’s Pedagogy for the Early Years, How Does Learning Happen? explains pedagogical documentation for its simplicity. “Pedagogical documentation is about more than recording events – it is a means to learning about how children think and learn” (p. 21). As I read this I wonder whether, the statement refers to the practice of taking photos of special events like a trip to a park or the zoo and the describing the experience as ‘the children had fun in the park’ or ‘the children enjoyed seeing the animals at the zoo’. Pedagogical documentation according to Ontario’s pedagogy for the early years is rather a “process to explore all of our questions about children” (p. 21). How Does Learning Happen? refers to Reggio educator, Carlina Rinaldi suggesting that documentation is a “way of listening to children that helps us to learn about children during the course of their experiences and to make the learning visible to others for interpretation” (p. 21). When I think about the words “during the course of their experiences” it tells me that pedagogical documentation should take place any time during everyday moments and not necessarily as a result of special events like trips and outings. In a previous blog post on the three elements of documentation illustrated above I suggested that “the when” of documentation should be in everyday moments and everyday places. This graphic also appears in my new textbook, Empowering Pedagogy co-authored with Beverlie Dietze (2016). “The who” of documentation are children and the focus is trying to make their learning visible while they are exploring the 100 and 100 more languages of expression. I like showing students, the videos from Carol Anne Wien to help them understand the who, what, where, why, when and how of documentation but it is a difficult process for them to understand and I think it requires time for complex and critical thinking. Seeing documentation from the perspective of “meaning making” helps to illuminate the complexities of the process. According to Moss and Dahlberg, 2008 “meaning making is evaluation as a participatory process of interpretation and judgement, made within a recognized context and in relation to certain critical questions: for example, what is our image of the child? What do we want for our children? What is education and care? It values subjectivity (or rather, ‘rigorous subjectivity’) (Lather, 1991), uncertainty, provisionality, contextuality, dialogue and democracy. It assumes a participant who makes – in relation with others – a contextualised, subjective and rigorous judgement of value. It foregrounds, therefore, democratic political practice, the exercise of collective deliberation” (p. 6). This definition of documentation is dense and thought provoking. It is not simple. Dahlberg and Moss (2008) are however, very straightforward about the origins of pedagogical documentation. “Pedagogical documentation has its origins in the innovative and, today, world-famous municipal early childhood services in the Northern Italian city of Reggio Emilia” (p. 6). Also clear is “the what” of documentation, which includes written or recorded notes, children’s work samples, photos or videos. Once collected these questions from How Does Learning Happen? can help to frame the documentation. By thinking about documentation deeply, I can see that it is a process not easily defined. It is so important to recognize that it is more than just the collection of notes and photos. In my textbook, I considered how it relates to the voices of children. Teaching in the early years can bring about power relations; thus, it is important to hear multiple voices in order to prevent privilege (Ryan & Grieshaber, 2005). To hear children’s voices, it is imperative to listen. Voice can be defined as giving expression. It is more than the sound produced by the vocal cords. Children can express themselves in multiple ways, in words and beyond. Giving voice to children’s interests and wonder requires adults to be comfortable with themselves and their wisdom. The process of pedagogical documentation gives children a voice. These visual, artistic representations—often referred to as “panels”—reveal children’s thinking and theory building and, as identified in Reggio Emilia, allow for a hundred languages to be spoken, often without an audible word (Dietze & Kashin, 2016). Documentation in this form is more than the display of a project’s topic-related materials— it is pedagogical. Pedagogical documentation is a “vital tool for the creation of a reflective and democratic pedagogical practice” (Dahlberg et al., 1999, p. 145). Many provincial and international curriculum frameworks recommend the process of documentation as a way to put into practice and make visible conceptual frameworks of children’s interests and knowledge. The words used to describe the process do not involve “display” (Dietze & Kashin, 2016). To practice pedagogical documentation, early learning professionals must look beyond the display and within the notes and words of what is posted on the wall in order to reach the interpretative stage. I appreciate Tracy Pickard’s recent blog post on documentation and I look forward to the continuing series as a way for me to understand what it is like in practice in Ontario’s full day kindergarten programs. I have been doing a lot of thinking about what pedagogical documentation is like in Ontario’s child care programs especially in light of my recent conversations with my friend and colleague, Cindy Green as we prepare to offer professional learning workshops for early childhood educators. I am continuing to think about many questions in connection with practice in child care as it seems to me that “the when” and “the where” of pedagogical documentation is potentially problematic. Without preparation time or with limited preparation time where and when ECEs document is concerning as it would seem to me that many would need to work at home on their own time to follow what seems to me is becoming an expectation of practice. This blog post is intended to help those determined to put in the extra time to make not only the children’s learning visible but their own professionalism as well. For additional help I recommend Susan Stacey’s new book because it takes the reader on a journey of the transformational possibilities of pedagogical documentation. Beginning with the “what”, the “why” and the starting points the book progresses in a logical sequence leading to connecting to families, digital documentation and reflection. Pedagogical documentation is such a complex topic. Both content and process, it requires observation, documentation and interpretation. Above all it is contextual – unique to the children, teachers and families involved. I think it can seem overwhelming to learn how to make children’s learning visible when often what you find is an abundance of academic articles on the topic that are more theory than practice. Susan interweaves the theory and practice beautifully and gives the right attention to both the process and the content. The photographs of the projects and documentation panels give the reader real-life examples to inspire their journey. When Susan recounts her own experience she makes a point to note that the journey of learning to develop and use pedagogical documentation does not happen quickly. It takes time but you do have to start somewhere. Pedagogical Documentation in Early Childhood is an excellent first stop on your journey of transformation. I see documentation as a fulfilling process with enormous power to support growth, development and reward to those who embed it in their practice. I know it comes with its challenges, not the least being trying to understand what it all means, but I think it is worth the effort. What do you think? I agree, understanding the numerous facets of pedagogical documentation is complex. I too have found Carol Ann Wein’s videos helpful when thinking about the process with early learning professionals. I particularly like when Wein suggests that pedagogical documentation should become a “habit of mind”. When this work becomes an integral aspect of our journey it positions educators to pause to gain a deeper understanding of children’s theories. The interpretation of children’s voices is often missing from the process. Pedagogical documentation is not about children having fun and enjoying their play. This is understood, a given. I favour pedagogical documentation that begins with an introduction. (Why are you writing about this experience?) The next component being a description of the experience (what are the children and educators doing and saying?). Next is our interpretation of the meaning underlying the results of observing and listening closely. (What might the children know and what skills are mastered or emerging?) Then my favourite component, where could the curriculum (the programming as Diane might say) emerge next? This complexity may support early learning professionals to provoke deeper thinking, their own as well as the children’s. Investing time thinking about possible curriculum directions will invite children to extend and deepen thinking. In terms of the time for documentation let’s invite the children to engage in the process with us. However, we will always need scheduled time for this exciting and important work. I so love this field! As always, Cindy your passion inspires me! Speaking on behalf of my organization KCCE HDLH is a marvelous observation to give perspective to the parent of their child’s learning. In regards to these observations and documentations. Do the teacher(s) have to extend/do activities to extend a particular interest or inquiry from the children?? It does make sense! It would be ideal if teachers extended experiences for children to build and scaffold children’s learning in regards to particular interests or inquiries.